Within the Museum’s collection this panel offers one of the most eloquent examples of the figurative and technical transformations that took place in southern European art in the first half of the 15th century. At that date tempera painting was gradually abandoned in favour of the advantages offered by oil, a technique imported from northern Europe and whose flexibility offered new ways of obtaining richer colours that could be combined in an almost unlimited range of gradations, making it easier to blend and mix tones and create transitions. The figure of Antonello da Messina was crucial for the arrival and dissemination of this revolutionary procedure. Nevertheless, oil painting was introduced in a gradual manner in Italy and it is thus common to find works produced in a mixed technique until well into the 16th century. Finally, this new technique that arrived in the Mediterranean was accompanied by a new, expressive pictorial mode, different to the one being developed in northern Italy. 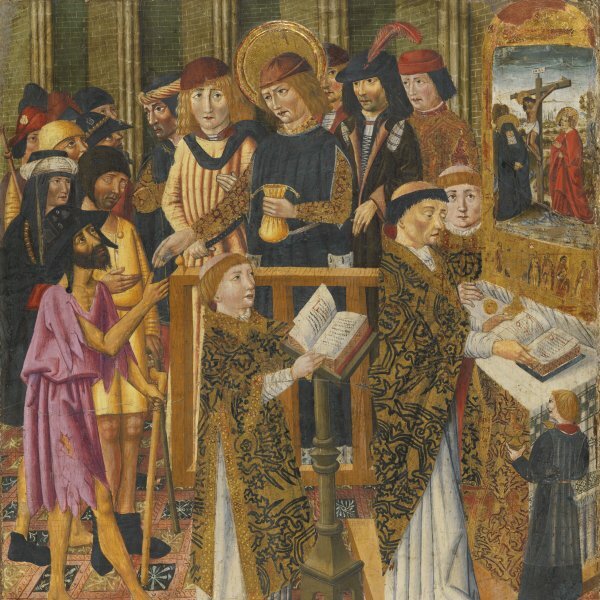 The various attributions given to this panel, the technique and the manner of depicting a traditional subject in Christian art all reveal a network of artistic relationships and influences between northern and southern Europe of which many aspects still remain to be studied. Since it was first published by Post in the early 1950s when it was in the Charles R. Henschel collection in New York, this painting has been the subject of the widest range of hypotheses with regard to its attribution. With some reservations, in 1952 Post attributed it to the Spanish painter Luis Dalmau. Court painter to Alfonso V of Aragon, Dalmau travelled to Flanders in 1431 and was familiar with Van Eyck’s work at first hand. The model for the figure of Christ in the present panel is notably close to Van Eyck and recalls the Christ by that artist in the panel in the Gemäldegalerie in Berlin. In 1955 Longhi and other art historians catalogued the work as by Colantonio due to the combination of Italian, Flemish and Catalan elements in the work, a combination only possible in southern Italy at that date. 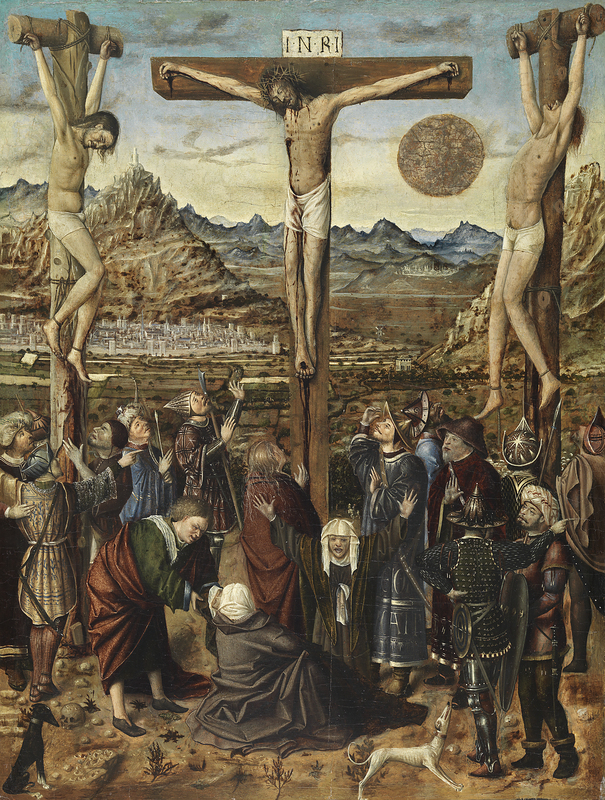 This idea was reinforced by the similarities observed between specific elements in the painting and an early Crucifixion by Antonello da Messina, a pupil of Colantonio. For this reason, Alessandro Marabottini and Fiorella Sricchia Santoro.attributed the panel to the early period of Antonello. Boskovits, however, considered it a work of an anonymous painter probably active in Naples. He acknowledged similarities between this panel and various works by Colantonio executed in Naples but did not consider them sufficient to attribute the present panel to that artist. In addition, he drew attention to the manner of painting the harsh, bare landscape, which has a flat plane opening out behind the cross. Boskovits also emphasised the nervous, emotional and expressive style with which the figures are constructed whose gestures at times border on caricature. The current attribution of this extremely interesting panel was made by Mauro Natale. He studied it within the complex context of north-south artistic relations and pursued the direction opened up by Post with regard to a possible Spanish attribution. Natale emphasised the influence of Van Eyck’s models, particularly his works prior to 1432 and specifically the diptych in the Metropolitan Museum of Art with regard to the structure of the landscape and the arrangement of the groups of figures. Natale favoured Sterling’s idea of a Valencian painter possibly inspired by a lost work by Luis Alimbrot. This coincides with the commentary on the work by Joan Ainaud de Lasarte who noted Hispano Moresque elements in the soldiers’ striking garments of a type only explicable within a Valencian context. According to Natale, the present Crucifixion includes a series of elements that are also present and are developed in a composition of the same subject by Rodrigo Osona the Elder in the Museo de Bellas Artes, Valencia. Particularly notable is the similarity of approach to some of the faces, such as that of Saint John, as well as the figure types.